What formula can be used to find the area of the parallelogram? 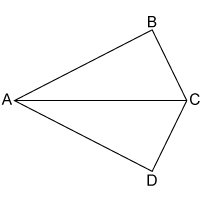 A rhombus has a side length of 6 and an altitude of 5. What is the area of the rhombus? Find the area of trapezoid ABCD, given BC = 21 inches, AD = 38 inches, and a height of 16 inches. If the length of line BD is 5 and the length of line AC is 8, what is the area of the kite? Trapezoid ABCD has an area of 57. BC = 7 and AD = 12. What is the height of the trapezoid? In rhombus ABCD, the length of AC is 10 and the length of BD is 9. What is the area of rhombus ABCD? AD measures 8 in parallelogram ABCD. If the area of ABCD is 44, what is the measure of the corresponding altitude? Ms. Simpson is planning to put a wall around a rectangular part of her yard. She wants the area to be 338 square feet. The walled part of the yard will have a length of 26 feet. a. How many feet should the width of the wall be? Show your work to support your answer. b. She wants to put a 4-foot gate on one side of the yard. How many feet of walling does she need for the rest of the walled yard? Show your work to support your answer. A parallelogram has a base of 10 and altitude of 3. A kite has diagonals of 6 and 9. Which has the greater area, the parallelogram or kite? Or, are the areas equal?